4Videosoft DVD Creator can burn DVD movies with almost all popular videos like MP4, AVI, FLV, MOV, etc. You can optimize the videos with the powerful editing functions. You can manage audio track and subtitle for your movies. 4Videosoft DVD Creator is able to create DVD movies with MP4, AVI, FLV, WMV, and other video formats. You are able to choose the DVD template, frame style, button type and title content through customize the DVD menu. What\\'s more, you can manage your audio track and subtitle for your output videos. 4Videosoft DVD Creator enables you to create DVD movies with popular videos MP4, AVI, FLV, MOV, MKV, WMV, etc. And you can save the DVD movies to blank DVD disc/DVD folder/ISO file easily. You can optimize your DVD movies with the versatile editing functions. To get a better effect, you are able to adjust video Brightness, Contrast, Saturation, Hue and Volume. And you can also trim the video length and crop video frame. Besides, you are able to add text and image watermark as you like. 4Videosoft DVD Creator allowed to preview the source video and take snapshot. 4Videosoft DVD Creator provides you with many colorful DVD menu/frame/button templates. You can add background music, background picture and opening film for your new DVD. The powerful program lets you add text for your DVD title, and you can set text font, color and size. 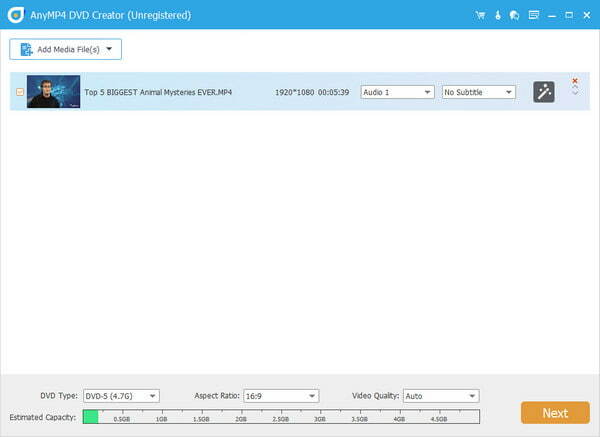 4Videosoft DVD Creator allows you to add your favorite audio track and subtitle for the DVD movies with no limitation. You can choose audio track like language, volume, latency, encoder, bitrate, channels. And subtitle option provides language, position, delay, font name and front size. Aiseesoft Nexus One Video Converter for Mac is the best Nexus One Converter to convert video to Nexus One. This Mac Video Converter for Nexus One can convert any video to Nexus One Video MP4, H.264 from HD video, AVI, FLV, SWF, WMV, RM. AnyMP4 iPod Transfer Platinum is one of the best assistant software, which enables you transfer all files between iPod and computer. So with it you can not only export all iPod files to computer but also import local files from PC to iPod. Aimone Video Joiner,joins video in Direct Stream Mode and Encode Mode,joins AVI, joins MPEG, joins 3GP, joins MP4, joins RM, joins WMV, joins VOB, joins mp3, joins wma, joins FLV, joins MKV,etc..
Aiseesoft Video Editor is the most video editing software which can help you easily set video speed and volume, optimize the brightness and contrast, crop video frame and clip video to several segments.